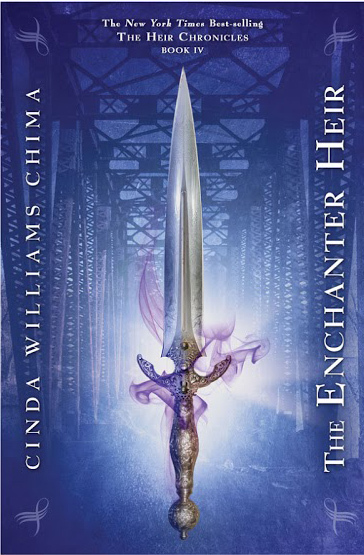 The Enchanter Heir is the story of magic, potions, and poisons gone wrong. No one knows the culprit or the reason and thousands of magical folk are dead. Those that survived the incident were youths not only faced with being orphaned but who now hold strange powers. Those children who did not die along with their parents and siblings live a guarded and threatened life riddled with secrets. Jonah was cursed with the touch of death and continues to be wielded in the ongoing war between wizards and lesser Weir (magic folk). In the search for the truth about his past he weaves fateful lies that not only threaten to destroy him but the girl he will never be able to love. This book is the fourth in The Heir Chronicles. The first three books held me spell-bound and captivated me with their honesty and commitment to the Weir world. The Enchanter Heir does a 180 degree turn. Chima provides a new slant in a familiar world introducing two fresh concepts: damaged Weir Stones (what gives the ability of magic) and the development of shades. These ideas bring a new level of interest to a pre-existing story. Chima maintains the texture and flavour of the first three books with a writing style that invites readers to look farther and dig deeper into the mystery with a natural pull at the senses. The sub-plots in the story work in harmony with the main plot as Chima skillfully balances young love against dark secrets and forbidden desires. Her knowledge of music, the industry and the art form, bring an air of authenticity and intrigue to readers less familiar with the venue. However, this story line is such a drastic departure from the base plots of the first three books that I felt lost and more than a little confused through several of the first chapters. When familiar names and places crept in and cropped up, my brain scrambled to connect the pieces and make sense of this new perspective. While the references to music and the detail regarding luthiers (people who make guitars) are extensive, the heavy thread of musical elements threatens to drown out the two new ideas introduced in this story. Yes, teens love music but there is a limit to the use of any gimmick and Chima has gone beyond acceptable usage. Speaking of gimmick’s I was less than impressed when shades, spirit based entities, were demeaning themselves by wearing dead bodies. The introduction of pseudo-zombies made me shake my head – with Chima’s earlier successes in the series she did not need to sink to this level for entertainment. Lastly, of all the plots and sub-plots Chima sets up within this book, none of them are even close to being resolved by the end of the story. In fact, the story doesn’t end in any natural way. It is simply cut off at the half-way point with everything left dangling. None of the characters are any closer to understanding themselves or their situation and the one moment when Emma, a major character, gleans some knowledge previously forgotten, it is inaccurate and incomplete. The reader knows more about what is going on than she does. This tactic could have worked if Emma went beyond our comprehensions and put new pieces of information together, but it simply doesn’t happen. Overall, I liked the book but found it too incomplete to be able to compete with Chima’s earlier masterpieces in this series. Perhaps the second installment will fulfill all that is lacking with the first part. Review by M.J. Moores, OCT, Author, Editor, Business Owner.